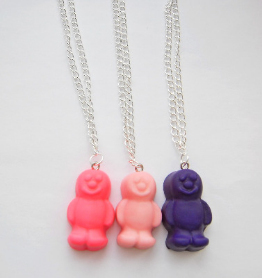 Novelty necklace with a cute jelly baby pendant. Pick between dark purple, light pink or hot pink. Jelly babies are around 25mm. * Size, appearance, shape may differ slightly from picture. Other colours such as green, red and blue are available on request, but will incur a delay.